We're bombing Libya again. I say again because many media outlets are erroneously reporting this is the first time. It's not, it's merely the first strike against ISIS in Libya conducted with the approval of the new Government of National Accord in Tripoli. Previously, there was an airstrike in February, 2015, when the U.S. struck an ISIS training camp in Libya. It's believed there were no civilians at the camp. The U.S. said it targeted and killed ISIS extremist Noureddine Chouchane, linked to the Tunisian beach attacks at Sousse which killed 30 Britons. But Serbia said the U.S. attack killed two of its embassy employees who were being held hostage. The Intercept said evidence supports Serbia's claim. More than 40 people were killed in the strikes. And Libya complained it was not consulted and had not approved. John Kerry announced today the U.S. supports training and equipping the military of the newly minted Libyan "unity" government so it can better fight ISIS. Speaking in Vienna, Secretary of State John Kerry said the United States and other major nations would back the Libyan government's attempt to win an exemption from a United Nations arms embargo. Who Did the U.S. Kill In Libya Airstrikes? The Libya Herald reports Abu Nabil Al-Anbari, was not killed in a U.S. airstrike near Derna in Libya yesterday. More importantly, how can the U.S. say al-Anbari is probably the Isis leader featured in the Egyptian Coptic Christian killing video from February, "A Message Signed with Blood to the Nation of the Cross?" The leader in the video spoke English with an American accent. At the time, experts said if he was not American, he spent a lot of time in the U.S. Nabil al-Anbari is Iraqi and a former police officer. In a significant escalation of American counterterrorism operations, the United States carried out an airstrike against a midlevel operative of Al Qaeda in Libya early Sunday, American officials said. It was the first time the American military has carried out any kind of airstrike in Libya since the NATO operation there in 2011 helped oust Col. Muammar el-Qaddafi. 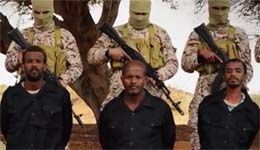 In a fairly confusing 29 minute video (I'm not providing the link), ISIS militants in Libya executed several Ethiopian Coptic Christians. Here's Reuter's article on the killings. Why is it confusing? There appear to be two sets of killings, one at a beach and one in an un-scenic field. The beach killings are similar to those a few months ago of Egyptian Coptic Christians. At first I thought it was a flashback, but the killers are wearing different clothes, and the victims are different. There's no indication of when the men in the field or the second beach group were killed. The White House has issued this statement. Isn't it a little strange that with so much international press coverage of the beheading of the 21 Egyptian Coptic Christians, no one has identified the beach in the video? Everyone reports the Christians were kidnapped in Sirte. But when it comes to the beach, no one names it. It's mostly described as "a Libyan beach." Some think the beach is in western Libya near Tripoli. Others think it is in Sirte. (The video says Wilayat (province) of Tarabulus, which means Tripoli, but a province could encompass other towns in the region, including Sirte. Still, Sirte is 460 km from Tripoli, almost a 6 hour drive according to google maps. 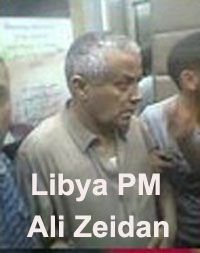 Libyan Prime Minister Ali Zeidan was kidnapped at gunpoint from the posh five star Corinthia Hotel in Tripoli just before dawn. As the photo shows, he's not wearing his glasses and appears to be in his jammies. The Group claiming responsibility for the kidnapping is The Operations Cell of Libyan Revolutionaries, which along with other former rebel groups, have been providing security to the military.The rebel groups which kidnapped Zeiden have been providing security to the military. One claimed credit on Facebook. NATO launched an airstrike today that killed Saif al-Arab Gadhafi, the 29 year old son of Libyan leader Colonel Muammar Gadhafi, and three grandchildren. [W]e were eventually brought to the villa, which was surrounded by reinforced concrete, cameras, and military positions. This is clearly an exclusive neighbourhood. Inside, total destruction. ....It's hard to imagine that anyone could have escaped unscathed, though according to the government spokesman the Libyan leader and his wife were present and are safe and well. But there's no independent evidence they were there. NATO airstrikes are intended to save civilian lives in Libya. Libya says today's strike was an assassination attempt. Here's the text of Obama's speech on Libya. If we tried to overthrow Gaddafi by force, our coalition would splinter. We would likely have to put U.S. troops on the ground, or risk killing many civilians from the air. The dangers faced by our men and women in uniform would be far greater. So would the costs, and our share of the responsibility for what comes next. I didn't get to see Obama deliver the speech. How do you think he did? And more importantly, do you agree with him? U.S. Tomahawk missiles have landed in Libya. President Obama today said he has authorized "limited military action in Libya" and that "that action has now begun." The first airstrikes will take out Gadhafi's air defenses in the western part of Libya, mostly concentrated around Tripoli and Misrata. "Once we do that, that would open up the environment where we could enforce the no-fly zone throughout, from east to west of Libya," the official said. The next phase will be "planes flying over Libyan airspace near Tripoli, and in the Mediterranean Sea near Benghazi. ." Also participating: The UK, Canada, France and Italy. 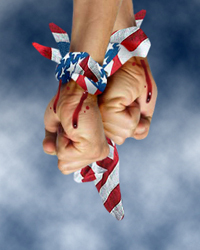 This is not an outcome the U.S. or any of our partners sought...We cannot stand idly by when a tyrant tells his people there will be no mercy." A federal indictment has been handed down in Miami against former Liberian Chief Charles Taylor's son, Chuckie Taylor, also known as Charles McArthur Emmanuel.